Home > Uncategorized > Are you prepared for the Global Careers Fair? Are you prepared for the Global Careers Fair? With less than four weeks until the next Global Careers Fair opens its doors, it’s time to start thinking about how you’re going to prepare! The Global Careers Fair gives you the opportunity to communicate with recruiters and HR professionals from some of the top organisations in the International Public Sector, which is why it’s crucial to ensure that you’re prepared for whatever questions may come your way on the day. 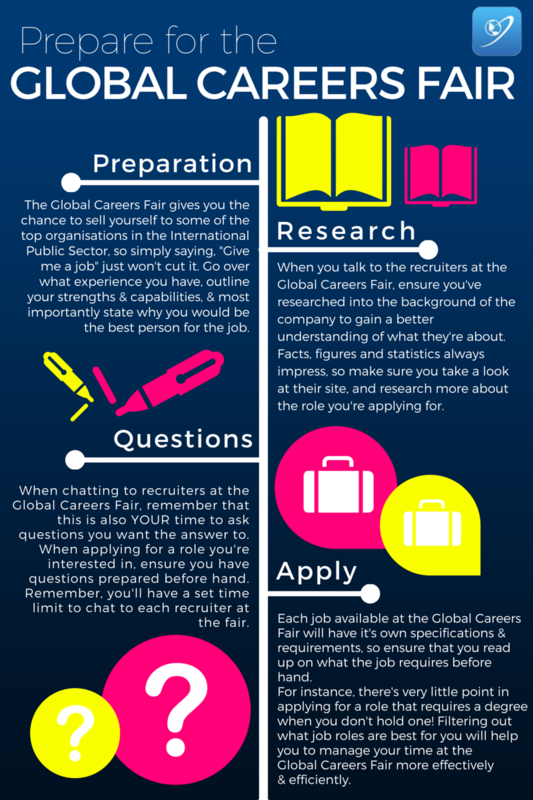 To help you along, we’ve created a brilliant and informative infographic that details just some of the basic methods of preparation for candidates of the Global Careers Fairs. To become a candidate for the Global Careers Fair, click here.